Q1. What is the Brand Integrity Program Against Piracy (Also called the TAG Anti-Piracy Program)? 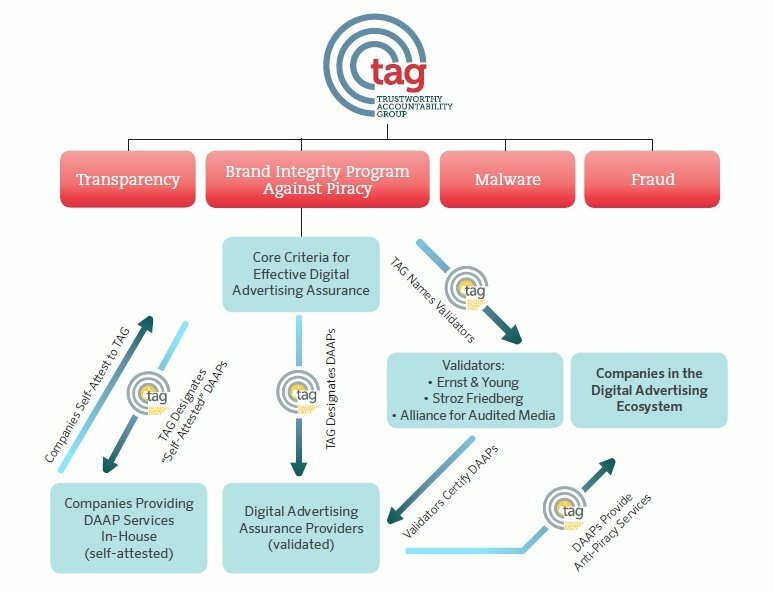 In 2014, the ANA, 4As, and IAB created a new organization, the Trustworthy Accountability Group (TAG), to help tackle issues facing digital advertisers, including malware, fraud, piracy, and lack of transparency. 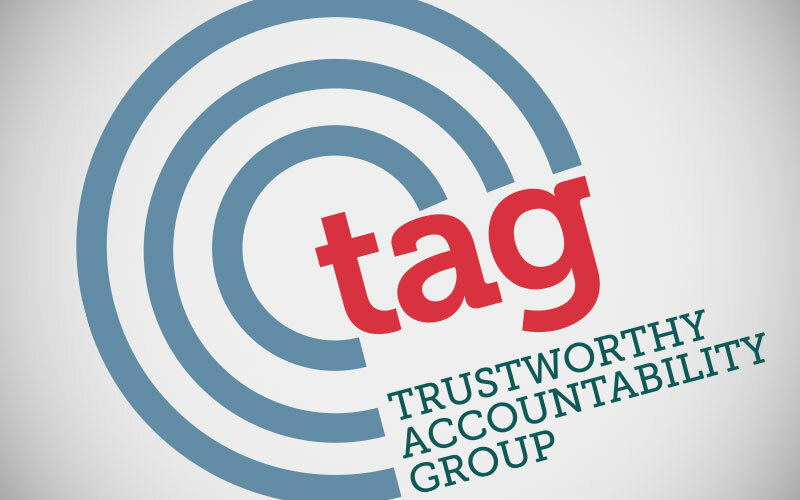 To help address the online piracy issues, TAG is rolling out a broad campaign to help advertisers protect their brands. The Brand Integrity Program Against Piracy, or Anti-Piracy Program, is a voluntary initiative based on the Core Criteria for Effective Digital Advertising Assurance. Using those criteria, TAG designates validated technology companies – known as Digital Advertising Assurance Providers (or DAAPs) – to help advertisers and their technology partners identify and screen out websites that do not meet each advertiser’s brand standards for risk of infringement. For advertisers, the process is simple. Once the program is deployed, advertisers and agencies can use a DAAP, or ask their advertising partners to use one, to identify websites and properties that don’t meet that advertiser’s brand standards. Each advertiser determines the level of risk it finds unacceptable, and the DAAPs help to ensure that the digital properties used in the advertiser’s campaigns meet those risk standards. Q2. How will the program work? Under the program, TAG works with authorized independent third-party validators, including the Alliance for Audited Media (AAM), Ernst & Young and BPA Worldwide, to certify advertising technology companies as Digital Advertising Assurance Providers (DAAPs). To be validated as a DAAP, applicants must show they can provide other advertising companies with tools that meet at least one of TAG’s five rigorous Core Criteria to identify and screen out websites and other properties that do not meet the advertiser’s standards for risk of infringement. In addition, large publishers and technology providers that provide services covered under the Core Criteria for Effective Digital Advertising Assurance to themselves can opt to self-attest that their in-house practices meet the criteria thus becoming a Self-Attested DAAP. In order to become a Self-Attested DAAP, a company must register with TAG and fill out a Self-Attestation Checklist. The Self-Attested DAAP Program Overview and Implementation Guide for Self-Attested DAAPs contain more information. Q3. How will this program strengthen the digital advertising ecosystem? The Brand Integrity Program Against Piracy addresses an issue in the digital advertising value chain for brands that want to ensure that their advertising does not run on websites and properties that fail to meet their brand standards. By validating DAAPs to help identify and screen out those undesirable sites, this program creates a simple and effective solution to address that issue. Q4. What are the criteria for validation as a DAAP? Identifying “Ad Risk Entities” (AREs): Assessing and identifying websites or other media properties that have a discernible risk of facilitating the unauthorized dissemination of copyrighted materials and/or the illegal dissemination of counterfeit goods. Preventing Advertisements on Undesired Ad Risk Entities: Enabling advertisers and agencies to restrict the display of their advertising on undesirable sites or other media properties that do not meet each advertiser’s or agency’s standards. Detecting, Preventing or Disrupting Fraudulent or Deceptive Transactions: Ensuring protocols and capabilities exist to find and limit ad placements on undesired sites that use fraud or deception to avoid the standards set by the advertiser or agency. Monitoring and Assessing the Compliance of Ad Placements: Detecting and reporting on undesired sites that are not in compliance with advertiser or agency instructions to allow remedial action to be taken. Q5. Does a company have to meet all of the Core Criteria for Digital Advertising Effectiveness to be validated as a DAAP? No, a company need only comply with a minimum of one (or more) of the five Core Criteria in order to be validated as a DAAP. Many DAAPs will offer a comprehensive range of services, but in some cases, DAAPs will be validated for a subset of the full criteria, based on the levels and types of anti- piracy services and tools they provide. Q6. How can advertisers and agencies participate in the program? The TAG Anti-Piracy Program gives advertisers the tools and information they need to enforce their own brand standards. Avoiding undesirable sites associated with piracy and/or the illegal dissemination of counterfeit goods is as important to advertisers as avoiding malware, fraud, and other harms. Advertisers can simply use a DAAP and/or ask their partners to use DAAPs to ensure their brands are protected. TAG also invites all advertisers and agencies to take the Anti-Piracy Pledge demonstrating their commitment to take all reasonable steps to prevent their ads from showing on pirated or infringing websites. Many reputable brands have already done so to show their commitment to fight online piracy, and more advertisers are invited to join this initiative. Upon review of the Pledge, the only other required step is to send an email to info@tagtoday.net stating the company’s intention to take the Pledge. Q7. Who has applied to become a DAAP? What is the status of the DAAP application process? Validated and self-attested DAAPs are listed on our website. Advertisers and their agencies should ask their advertising technology partners to work with those DAAPs to ensure that their campaigns meet their internal brand protection guidelines. TAG works with third-party validators like AAM, Ernst & Young and VPA Worldwide to designate DAAPs. While TAG remains the ultimate arbiter, AAM, Ernst & Young and BPA Worldwide bring independent institutional experience and credibility to this type of validation process, and we believe their active participation will raise awareness about the Anti-Piracy Program and encourage voluntary adoption of the program. Q9. How will the self-attestation process work and who will it cover? Many companies – such as large ad networks and publishers – have already created internal processes similar to those outlined in the Core Criteria for Effective Digital Advertising Assurance to prevent their advertising from running on sites associated with the distribution of pirated content or the illegal dissemination of counterfeit goods. For those companies already meeting the Core Criteria, we’ve included this self-attestation element to the program. If TAG receives reports that any companies who have voluntarily self-attested are not complying with the Core Criteria for the program, TAG will require them to undergo a formal DAAP validation in order to promote themselves as a Self-Attested DAAP. Participating companies are listed here. Q10. How will the program be funded? The TAG Anti-Piracy Program will be funded by the approved Validators and by the companies who use DAAPs, as a part of the price of the DAAPs’ services. Companies choosing to self-attest to the Core Criteria for Effective Digital Advertising will also help fund the program. Q11. Where can companies find more information about the TAG Anti-Piracy program? Companies wishing to use DAAP services can find more information here. Advertisers and agencies also interested in taking the Anti-Piracy Pledge should review it and send their intention to commit to the Pledge to info@tagtoday.net. Companies wishing to apply as Validated DAAPs should register with TAG and can find more information here. Companies wishing to self-attest should register with TAG and fill out the Self-Attestation Checklist. The Self-Attested DAAP Program Overview and Implementation Guide for Self-Attested DAAPs contain more information. For any other questions, please email info@tagtoday.net.